It's the most unexpected sequel of all! It's our tribute to the immortal issue G1 Marvel #31 "Buster Witwicky and the Carwash Of Doom"! Buster Witwicky! Jesse! Shockwave! Ratbat! Pre-Transformers non-Diaclone toys! And a most surprising guest star from the Seeds Of Deception cast! The story features a double version of the cover: the classic G1 US styled and the Untold Marvels one. Untold Marvels G1 US #47.1 - "Swashbuckling with GrandSlam"
From the 18th century, a story of pirates, doubloons and cannons: it's an Underbase Saga tie-in! Finally, the forgotten heroes of that legendary battle get their own time in the spotlight. Well, one of them at leasr, and he gets some lines as well! Check out the authors' notes for the usual behind-the-scenes. Presenting the opening chapters of the Regeneration Plus fanseries. In issue #0, Prowl and Ratchet must deal with the consequences and mysteries of "Prime Time!" (G1 Marvel US #12), while a small group of Decepticon separationists, lead by Breakdown, needs a new leader, after the events of "Totaled!" (G1 Marvel US #41) and "Club Con!" (G1 Marvel US #47). See the blog entry for the whole collection of pages, or browse them from the cover, using the links in the Comment Section for each page. Also check out the Comment Section for the RAR and PDF version of the files, such as the low res PDF format. Presenting the new installment of the Regeneration Plus fanseries. In issue #1: Prowl's fate after "Prime Time" is revealed! The "Underbase Saga" deserters must find a leader: will zombie Motormaster do? The crashlanded Ark that was last seen in "The Last Autobot" is now being targeted by Cobra and A.I.M. but they have no idea that the Dark Matrix Entity lingers around! "Megatron Changes The World" - "Fatal Encounter" - "Bring Us Our Leader!" See the episode gallery for the whole collection of pages, or browse them from the cover, using the links in the Comment Section for each page. Also check out the Comment Section for the RAR and PDF versions of the comic. A new story for the Untold Marvels series: G1 UK #261.1 - "Whatever Happened to the Cybertronians: Spanner". It's the beginning of the saga of the Forgotten Cybertronians: did Spanner die inside his Space Bridge alt mode? Was Macabre gone for good, and why didn't Flame resurrect him among all those other Cybertronians? Where did Ultra Magnus (Cybertron's greatest hero) go after the "Deadly Games" affair? Gen1 Extra - "All In The Style"
After Untold Marvels and Regeneration Plus, another expansion of the original G1 comics is here: it's Gen1 Extra! Featuring Jazz and Skywarp, here is the PDF version of one of their clashes: All In the Style!. Art and story by Joe Teanby. The Untold Marvels series presents the stories that bridge the original G1 Marvel comics and the latest Regeneration One series written by Simon Furman for IDW. The main goal of this collected edition in PDF format is putting the G1 UK stories back into continuity, making them work with the "rules" set by Regeneration One. Great adventures such as Time Wars and Target: 2006 simply cannot be abandoned and forgotten! In previous episodes, Spanner, Macabre and Emirate Xaaron have interacted as they never did before with Unicron, Primus and each other. Now it's time for Ultra Magnus (Cybertron's Greatest Hero) to step in on a cosmic chessboard controlled by Primus and Unicron... until "The Vanishing" comes! In a not-so-distant future, the Last Autobot will tie up the threads of their untold adventure, thus explaining where the Cybertronians went during the Unicron Battle and setting the premise for the teeming planet seen in the Regeneration One books. As a final bonus-- Optimus Prime and Galvatron will reveal a major secret behind the birth of Rodimus Prime! The first story included in Regeneration Plus #2 is: "A Vulgar Display of Power". Continuing from Bring Us Our Leader!, this episode chronicles the meeting between Breakdown's group and the mysterious leader of Cyclonus and Scourge. Who's going to live, who's going to die and who's going to rule? The second story included in Regeneration Plus #2 is: "A Flight Into The Maelström". What will Sixshot make of Cyclonus and Scourge, after their not-so-great performance against Breakdown's Decepticons? 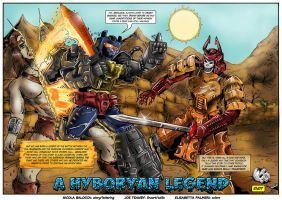 Regeneration Plus: "A Hyborian Legend"
Regeneration Plus presents Transformers Tales, an aperiodic series featuring special not-in-continuity stories focused on unique reinterpretations of the Transformers universe. 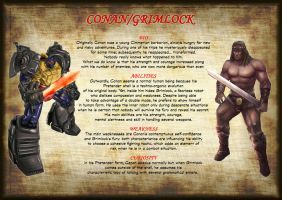 The first installment of the series brings Bludgeon and his Pretender crew to an age undreamt of: how shall these Decepticon fare against "A Hyborian Legend"? By Nicola Balocca, Joe Teanby, Elisabetta Palmeri, Thong Nguyen, Alberto Camarra.